Why visit Lake Titicaca and Puno? Lake Titicaca straddles the border between Peru and Bolivia. This is where the Quechua traditions meet those of the Aymara. The Incas originated from the islands on the lake, which they believed to be the birthplace of the sun, making a visit here a fascinating cultural experience. The area is particularly known for the floating reed islands of Uros, while Puno is regarded as the Folkloric capital of Peru. Take a cruise on the deep blue waters of the highest navigable lake in the world. Visit the floating Uros reed islands, made from tortora reeds harvested from the lake, and home to the Uros Indians. One of the 44 Uros islands is a living museum to this traditional way of life, and visitors can see how the Uros Indians use reeds for building homes and boats. Stay on Suasi, a private 106 acre island near the remote northern shore. Experience the traditional way of life by staying with families on a homestay on Amantani or Taquile islands. Terraced Amanti is home to farmers, fishermen and weavers, while Taquile has a thriving tradition of weaving and knitting. 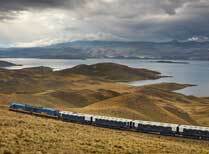 Take a trip out to Sillustani. Set by the shore of Lake Umayo, itself home to a wonderful range of birdlife, Sillustani is the site of ancient funerary towers of the pre-Inca Colla people. Some of the towers are 12m high and once housed the remains of entire families. 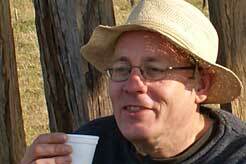 Shop for the famed Taquile textiles or knitted hats. Visit Peru's 'Folkloric capital', Puno. This small colonial city is set between the shores of Lake Titicaca and the surrounding mountains. Visit Puno’s museum, home to pre-Hispanic and Colonial art, including Moche pottery, Inca silverwork and Paracas textiles or explore the cathedral, famous for its carvings. Enjoy the wonderful lake view from Puno’s harbour and steep hillside streets or attend one of Puno’s many folklore festivals. Step on board Yavari. This early Victorian steamship has been carefully restored and is now a museum. Most people tend to avoid the worst of the rainy season from about November to April. 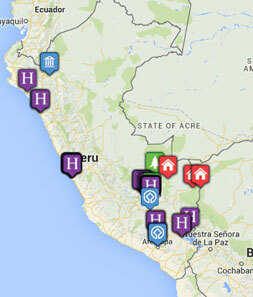 For more information about when to travel in Peru, see our When to visit Peru page. A simple island homestay on Lake Titicaca. 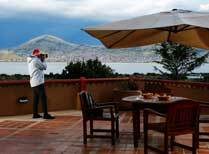 Casa Andina Premium Puno is located by Lake Titicaca and has great views of the lake. 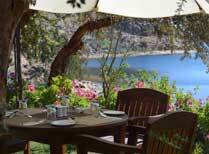 A wonderfully tranquil and comfortable eco lodge on a private 106 acre island near the remote northern shore of Lake Titicaca. 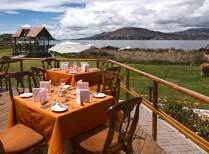 Posada del Inca Puno is a comfortable modern hotel set on the shores of Lake Titicaca and just 5 kilometres from the centre of the historic city of Puno. 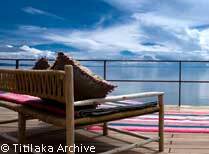 Modern, luxury 18-suite lodge on the shores of Lake Titicaca.